Standard 2.4L DOHC 4-cylinder engine offers an impressive EPA-estimated 22 MPG city/32 highway (FWD) along with an Eco button you can press to maximize efficiency. The 6-speed automatic transmission and available AWD provides refinement and responsiveness, no matter which engine you choose. Available dealer-installed trailer hitch, standard Trailer Sway Control and standard Hill Start Assist, you can tow with confidence. Equinox designers and engineers set out to create an uncompromising design with flowing lines and sleek contours that not only turns heads, but also helps to reduce wind drag and boost efficiency. 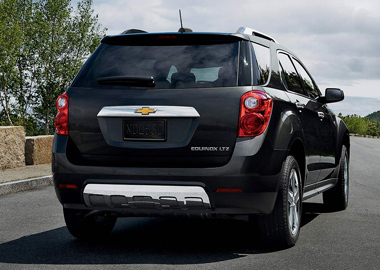 For even more refinement, Equinox LTZ is dressed with sophisticated chrome accents including door handles, mirrors and roof rack side rails. The lower front and rear fascias also feature bright accents to polish off the look. Available gorgeous 18"chrome clad aluminum wheels. Up front, available heated 8-way power front seats offer the driver and front passenger personalized comfort. Inside Equinox, you feel instantly at ease – and perpetually indulged. The Multi-Flex® sliding rear seat can also be pulled forward to add nearly 8 inches of cargo room, or folded completely flat to create 63.7 cubic feet of maximum cargo space†. And with a 60/40 split-fold design, ample storage compartments and an available programmable power liftgate, loading it all is that much easier. 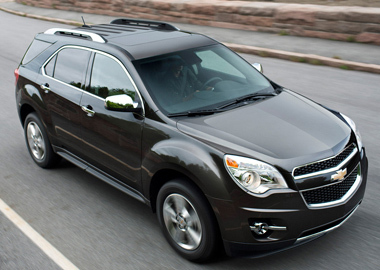 The 2015 Equinox is the first car in its class with built-in available 4G LTE Wi-Fi® technology. With a powerful available 4G LTE signal, you and your passengers will have the ability to connect up to seven devices to the Internet via available Wi-Fi®. Customize your driving experience by arranging the icons and features on the available Chevrolet MyLink 7-inch diagonal color touch-screen. Choose the information or options you use most and place them on your home screen. The interface allows you to touch and swipe on the screen just like you do on your smartphone. Now you’re ready to bring your favorite music and entertainment with you. The available Chevrolet MyLink Radio works with your compatible smartphone and Bluetooth® wireless technology to stream music and entertainment through the Pandora® Internet Radio5 mobile app. Or you can listen to select commercial-free programs with the 3-month trial of SiriusXM® Satellite Radio. The latest Chevrolet MyLink Radio even allows you to store up to 60 favorites, including radio stations, contacts, music and other media. Take navigation to the next level of ingenuity with on-screen OnStar® Turn-by-Turn Navigation, standard for six months. Receive directions through an on-screen display and hear directions from an automated voice. An OnStar® Advisor can also send a download of a destination to the Chevrolet MyLink navigation system if your vehicle is equipped with the available Chevrolet MyLink Navigation Radio. Get an extra pair of eyes where you need them most with the available rear vision camera. 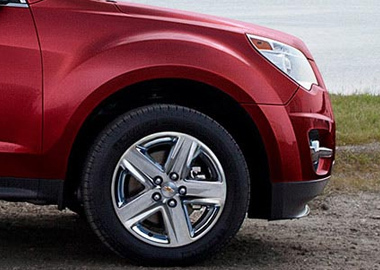 The camera projects an image of what's behind your Equinox onto a 7-inch diagonal color touchscreen. It lets you see everything from telephone poles to kids on bikes. Even the most careful drivers can't predict what might happen on the road ahead of them. That's where the available forward collision alert comes in handy. Smart camera sensors constantly scan traffic for stopped or slowing vehicles and alerts you before the risk of collision. That's piece of mind. This smart technology uses a camera mounted near the inside rearview mirror to help alert you if you unintentionally drift from your lane without signaling, helping you keep safe during your daily commute, or anywhere else your travels may take you.